Percutaneous coronary interventions (PCIs) of saphenous vein grafts (SVGs) is challenging and is associated with adverse short- and long-term clinical outcome as compared to native coronary arteries. SVG perforation is rare but catastrophic and needs immediate attention. Various factors predisposing for SVG perforation are old degenerated graft, ulcerated plaque, severe fibrotic, or calcified lesion necessitating high pressure balloon or stent inflation, use of intravascular ultrasound (IVUS) or other atheroablative devices. Management includes prolonged balloon occlusion, reversal of anticoagulation, use of covered stent, and emergency pericadiocentesis if required. Percutaneous coronary intervention (PCI) for saphenous vein graft (SVG) lesions has higher complication rates and poor long-term outcomes as compared to native coronaries. The perioperative complications may include no-reflow, abrupt closure, distal embolization causing perioperative myocardial infarction and rarely SVG perforation. Here, we report a case of SVG perforation managed successfully with a covered stent and discuss about its predictors and management. A 76-year-old male known case of hypertension and diabetes mellitus was admitted to our institute with complaints of crescendo angina and dyspnea for 1 week. He had undergone coronary artery bypass graft (CABG) surgery with left internal mammary artery (LIMA) to left anterior descending (LAD) artery, radial artery graft to right coronary artery (RCA), and SVG to obtuse marginal (OM) artery 9 years ago and PCI to SVG-OM graft with drug-eluting stent 2 years ago. 12-lead resting electrocardiogram revealed significant ST depressions in V4-V6, lead I and aVL. Two-dimensional (2D) transthoracic echocardiography (TTE) was normal with normal left ventricular systolic function (left ventricular ejection fraction (LVEF) ~ 60%). Serum biochemistry was within normal limits except significantly raised cardiac enzymes and troponins. 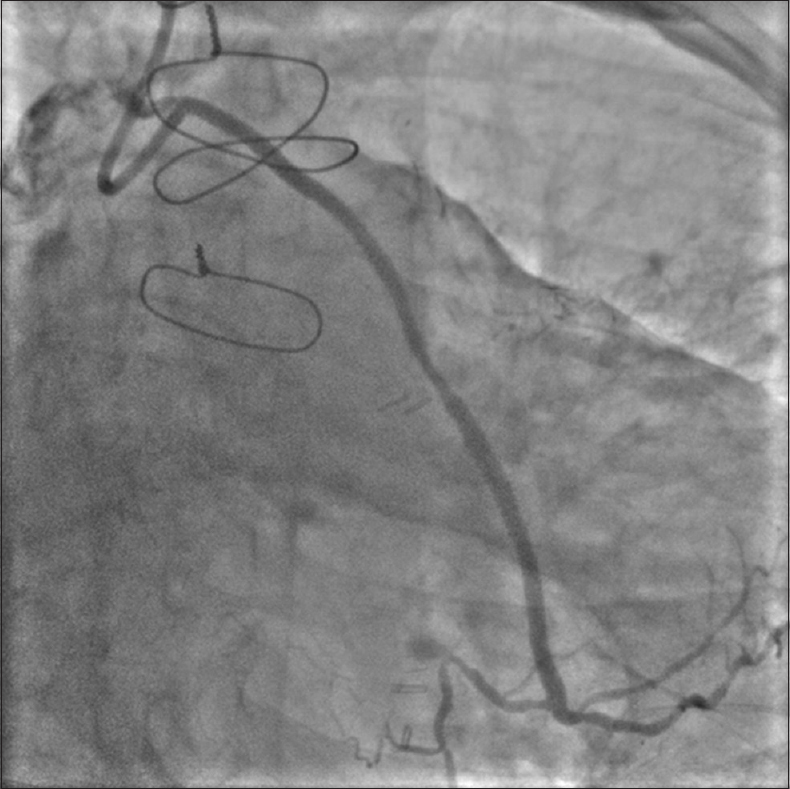 After informed consent, coronary angiography by right transradial approach revealed native triple vessel disease, patent LIMA-LAD graft, patent radial-RCA graft, and significant short discrete eccentric lesion in SVG-OM graft distal to the patent stent [arrow, [Figure 1]a; S Video 1]. PCI to SVG-OM graft was planned and the ostium was cannulated with JR4/6F guide catheter, but was exchanged with AR2/6F guide catheter (Launcher, Medtronic Inc, Minneapolis, MN) for better backup support. The lesion was crossed with 0.014" whisper guide wire (Abbott Vascular, Santa Clara, CA) and the direct stenting was planned. The stent 3.5 × 18 mm Xience Pro (Abbott Vascular, Santa Clara, CA) was positioned across the lesion (arrow, [Figure 1]b). 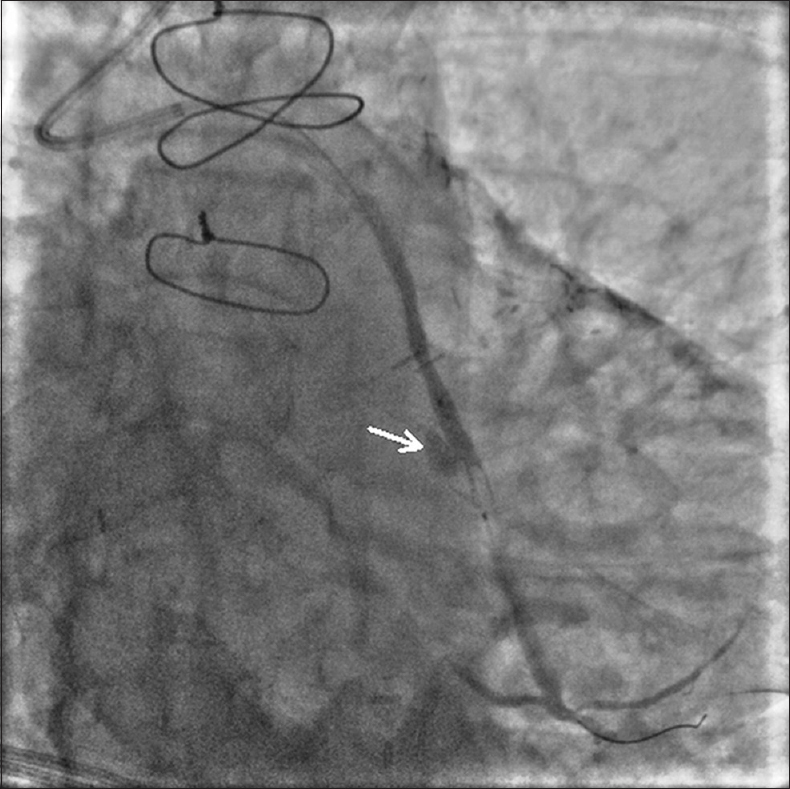 While inflating the stent at 14 atmosphere, there was sudden extravasation of contrast revealing class III perforation at the stent site [arrow, [Figure 2]; S Video 2]. Immediately, the perforation was occluded proximally with the same stent balloon. TTE revealed minimal pericardial effusion without any clinical or echocardiographic evidence of cardiac tamponade. Even after prolonged balloon inflation there was still persistent leakage and therefore, the perforation was sealed with 3 × 18 mm covered stent at 12 atmosphere (Jostent Graftmaster, Abbott Vascular, Santa Clara, CA) with TIMI III flow [Figure 3]; S Video 3]. Patient remained hemodynamically stable during the procedure and hospital stay and was aymptomatic at 1-month follow-up. SVG perforation was first reported by Drummer et al., and may be catastrophic if immediate measures are not taken. The predisposing factors for perforation are old degenerated grafts, ulcerated plaque, eccentric fibrotic or calcified lesion, and use of oversized stent. It may be procedure related due to guide wire penetration, subintimal balloon inflation, overexpansion of balloon, or stent and rarely due to intravascular ultrasound (IVUS) catheter or during atheroablative procedure. PCI to SVGs is a challenge for an interventional cardiologist and needs adequate experience and expertise. SVG perforation is a cardiac emergency and needs immediate intervention. Use of undersized stent and balloons may prevent this fatal complication without compromising short- and long-term results. Brilakis ES, Rao SV, Banerjee S, Goldman S, Shunk KA, Holmes DR Jr, et al. Percutaneous coronary intervention in native arteries versus bypass grafts in prior coronary artery bypass grafting patients: A report from the National Cardiovascular Data Registry. JACC Cardiovasc Interv 2011;4:844-50. Drummer E, Furey K, Hollman J. Rupture of a saphenous vein bypass graft during coronary angioplasty. Br Heart J 1987;58:78-81. Myles JL, Ratliff NB, Hollman J, Zaidi A, Tan TB. Mechanisms of vessel injury during percutaneous transluminal angioplasty of saphenous vein bypass grafts and coronary arteries. Am J Cardiovasc Pathol 1988;2:133-6. Marmagkiolis K, Brilakis ES, Hakeem A, Cilingiroglu M, Bilodeau L. Saphenous vein graft perforation during percutaneous coronary intervention: A case series. J Invasive Cardiol 2013;25:157-61. Lowe R, Hammond C, Perry RA. Prior CABG does not prevent pericardial tamponade following saphenous vein graft perforation associated with angioplasty. Heart 2005;91:1052. Astroulakis Z, Mathur A. Images in cardiovascular medicine. Percutaneous intervention to a right coronary artery vein graft complicated by perforation into the right heart. Circulation 2006;114:e549-50. Poulter RS, Dooris M. Localized pulmonary artery compression due to saphenous vein graft perforation during percutaneous coronary intervention. Can J Cardiol 2011;27:389.e25-8. Ben-Gal Y, Weisz G, Collins MB, Genereux P, Dangas GD, Teirstein PS, et al. Dual catheter technique for the treatment of severe coronary artery perforations. Catheter Cardiovasc Interv 2010;75:708-12. Glover B, Johnston P, Spence M. Percutaneous management of a saphenous vein graft perforation using a covered stent and final coil embolization technique. Arch Med Sci 2010;6:991-2. Hong YJ, Pichard AD, Mintz GS, Kim SW, Lee SY, Kim SY, et al. Outcome of undersized drug-eluting stents for percutaneous coronary intervention of saphenous vein graft lesions. Am J Cardiol 2010;105:179-85.